The Eighteenth-Century Seminar (ECS), sponsored by the History Department and the Humanities Council, provides an interdisciplinary forum for scholars interested in all aspects of eighteenth-century history and culture in Europe and across continents. The seminar series is open to faculty and students from Princeton and nearby institutions. It hosts several invited speakers each year, and a one-day symposium on a particular theme. Past themes have included "1763: The First Global War and Its Consequences"; "Constitution-Writing in the Long Eighteenth Century"; "Rethinking the Age of Revolutions"; and "Fighting Words: Polemical Literature in the Age of Revolutions." 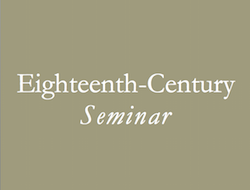 For the 2018-19 academic year, the Eighteenth-Century Seminar will be coordinated by Professors Linda Colley and Yair Mintzker, and graduate students Netta Green and Min Tae Cha. View past seminars in our events archive.